Fridgeezoo Animals Remind You To Close The Damn Door | OhGizmo! 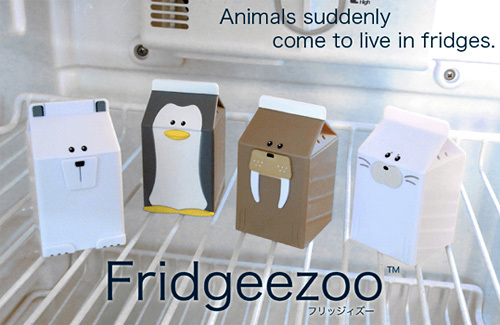 Think of these adorable Fridgeezoo animals as a smaller version of your parents, sitting inside your fridge, reminding you to close the door if you spend too much time window shopping for something to eat. As you can see they’re all themed after animals that live in cold climates like a polar bear, penguin, walrus and seal, and while they start out with a friendly greeting when you open the door, if you linger for too long letting out too much cold air they’ll soon get snappy about your apathy towards eco-friendliness. The animals are also voiced by a Japanese hip-hop crew known as the Romancrew, which takes away about 95% of their cuteness factor, but the novelty is still there I guess. ~$25 each (¥1,980) available from the Appare Store. I really adore what you had to say. Keep going because you definitely bring a new voice to this subject.